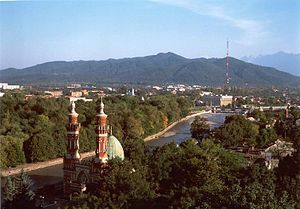 Vladikavkaz is the capital city of North Ossetia and a major transit hub for the North Caucasus region. Its position on the Georgian Military Highway makes it a staging post for journeys to both Georgia and South Ossetia. Modern Vladikavkaz was founded in 1784 at the gateway of Daryal Canyon. Basically no English is spoken. Do not expect to be able to comfortably move around the city without brushed-up knowledge of Russian or assistance from a translator. 43.20544.6066671 Beslan Airport (OGZ IATA) (15 km (9.3 mi) from downtown). 44.21344443.1415282 Vladikavkaz railway station. Trains run daily to Moscow (35 h) and other southern regional cities such as Rostov on Don (13 h), Adler (17 h) and Novorossisk (18 h). 43.02598544.6759031 Mukhtarov Mosque. A striking historic mosque completed in 1908. The mosque takes its name from the Azerbaijani millionaire Murtuza Mukhtarov who financed its construction. Vladikavkaz also has quite a few outdoor sculptures and monuments. The Mariinsky Theatre has a branch in Vladikavkaz. The main street, Prospekt Mira, runs roughly parallel to the Terek River, and is a pleasant boulevard with shops and restaurants. The railway station is to the east of Prospekt Mira's northern end. Vogue Restaurant, U. Mayakovskogo, 21, ☎ +7 8672 53-95-64. 10.00-24.00. Salads, Pasta, Pizza, Deserts, full bar and shisha. Lots of pretty people who like to stare at foreigners. One of the few places in town with outside seating. Grusha, Ul. Shumlevicha, 41, ☎ +7 8672 54-88-55. 12.00-24.00. Excellent Georgia food and shashlik. Loud music. Magiya Cafe, Ul. M. Gorkogo, 9, ☎ +7 8672 54-06-48, e-mail: kofemagia@mail.ru. 9.00-23.00. Good deserts, light meals, drinks, great coffee. Leonardo Cafe/Gallery, Ul. Revolutsii, 62, ☎ +7 8672 53-88-88. 12.00-23.00. Interesting local art. Good meals, good cocktails, basement bar filled with smoke. 43.02860644.6803971 Hotel Imperial, Prospket Mira, 19, ☎ +7 8672 54-74-74. directly on the central street of the city. Comfortable, recommended over other options, little bit pricier. Restaurant Bavaria behind the hotel with outside seating and extremely loud karaoke during the summer months. Sauna onsite. The city's phone code is 8672. The striking North Ossetian mountains: Tse and Fiagdon in particular. However, all non-Russian citizens are forbidden to travel outside the main towns of Vladikavkaz, Beslan, Alagir and Ardon. If found by local authorities outside the regulated areas you may be subject to a fine and/or deportation. Georgia - head south on the Georgian Military Highway to the border post at Verkny Lars and then to Kazbegi in Georgia. South Ossetia - head south on the Trans-Caucasian Highway through the Roki tunnel to the disputed region's capital, Tskhinvali. This city travel guide to Vladikavkaz is a usable article. It has information on how to get there and on restaurants and hotels. An adventurous person could use this article, but please feel free to improve it by editing the page.